As Consolidated Edison, New York City’s electricity provider, fields criticism for a recent blackout that left thousands of New Yorkers without power for nine days, the utility continues to address a serious danger that may still slumber beneath city streets: stray voltage. Last Wednesday, Con Ed officials met with a panel of electrical engineers to discuss ways to avoid shocks to and electrocutions of pedestrians who come in contact with street-level structures that leak stray voltage. The meeting was mandated by a landmark court settlement made in the wake of the fatal electrocution of Jodie Lane, a 30-year-old doctoral student at Columbia University’s Teachers College. Lane was killed by stray voltage in January 2004 after falling onto an electrified metal Con Ed service box cover as she walked her dogs in the East Village. In addition to Lane’s death two and a half years ago, several people, hundreds of dogs, and even one carriage-horse have been shocked by stray voltage on New York City streets in recent years. Accidents involving stray voltage occur when metal structures, like manholes, service box covers, or streetlights, become electrified by malfunctions in underlying wires. When pedestrians or animals touch bare skin, paws or hooves to these “hotspots,” they instantly become living wires, electricity shooting through their bodies. Sakis Meliopoulos, one of the electrical experts who participated in the Con Ed meeting, says that progress is being made in addressing the problem of stray voltage, but the utility has not yet implemented structural changes to New York’s underground electrical system that are necessary to make the city safer for pedestrians. Con Ed’s most recent annual report, made public earlier this year, confirms Meliopoulos’ assertions that stray voltage is still a problem in New York City. From December 2004 to December 2005, there were 1,214 instances of stray voltage among the utility’s publicly accessible electrical structures found throughout the city and most of Westchester County. Streetlight posts made up the bulk of these incidents, with 1,083 found to be electrified by stray voltage. Given the inevitability of insulation degradation, Con Ed has concentrated on increasing and improving their testing for stray voltage. Meliopoulos said that Con Ed has spent about $90 million dollars on stray voltage testing since Lane’s death. After the accident, the New York State Public Service Commission ordered Con Ed to test each of its more than 700,000 publicly accessible electrical structures at least once per year. When the utility detects stray voltage leaking from its equipment or if a shock is reported, the problem is immediately investigated and corrected. A relatively inexpensive device called a ground fault circuit interrupter is the most feasible way to prevent stray voltage accidents, said Meliopoulos. GFCIs have been required for most outlets in American homes, apartments, and businesses since 1971. They are recognizable by the “Test” and “Reset” buttons on outlets in bathrooms or around sinks. This simple device prevents severe shocks by cutting off power to an outlet that receives a sudden surge of returning electricity, like when a hairdryer is dropped into a bathtub. When this happens, the GFCI senses the spike in electricity returning from the shorted hairdryer and trips the circuit, cutting off power at that particular outlet. When installed at manholes, service box covers, or streetlights, GFCIs work the same way. 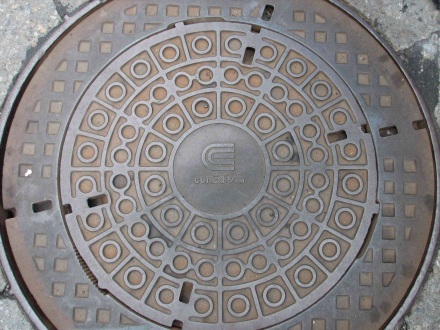 If a GFCI-fitted manhole became electrified by an underground wire, the device would sense the surge, cut off power to the underlying electrical circuit, and safely divert electricity away from the manhole. These devices have been required in the public electrical systems of many European cities for nearly 20 years, explained Meliopoulos, who helped install similar devices in the municipal electrical system of New Haven, Connecticut. Meliopoulos says that installing GFCIs at every street-level electrical apparatus in New York would have a huge impact on pedestrian safety in the city. “The number of electrocutions can be reduced drastically,” he said. And New Yorkers do continue to get shocked by the electrical structures under their feet. Con Ed received over 400 calls reporting pedestrian shocks last year alone. This March, a nine-year-old Harlem boy was hospitalized after being shocked by a metal plate on the corner of 127th Street and Lennox Avenue. And in May, an eight-year-old Staten Island girl’s feet were badly burned by a service box that was electrified by an improperly wired streetlight nearby. Meliopoulos is hopeful that Con Ed will make progress in implementing structural changes to New York’s underground electrical infrastructure by his next meeting with the utility, scheduled for this December. “Eventually, there will be some good work that will put them in the right direction,” he said. Con Ed maintains that they are already doing everything in their power. “We’re giving it our very best shot,” said Con Ed spokesperson Olert. Sounds like Con-Ed has a real problem with lost neutrals. The older cables probably have concentric neutrals that are exposed. This means the cables don’t have an outer jacket covering them. Over time the exposed neutrals fail and stray voltages start to appear on all kinds of metal objects. Some of these objects might be street light poles, metal enclosures on electrical equipment of the utility company, electric meter bases, t.v. cable boxes, telephone pedestals, and all sorts of other metal objects on the customers property. Please check out the site in progress: http://www.currentskillcanines.org and participate in our walks for canines killed by stray voltage, find articles on victims, and other ways to help! The only solution to stray voltage dangers is to have the on site real time warning system called the Electrified Cover Safeguard installed on all street lamps, manhole covers and utility boxes. The technology makes a audible warning such as a beeping sound as well as a flashing light to warn people and pets not to step on or touch dangerously charged manhole covers and street lamps. Periodic testing of the infrastructure is not good enough, since one second, something can be ok and just a few moments latter, can become electrified. The company that invented the Electrified Cover Safeguard, seems to have patented the concept of an on-site real time stray voltage system. More information on this technology can be found at http://www.ManholeSafety.com.